The cushion craze continues, but this time we have a completely new brand I want to introduce today: The W-Lab W-Honey Beam Cushion! And as the name suggests, this cushion BB contains Honey extract, which is perfect for dry skin and for cold seasons! This cushion was offered to me by Korean cosmetics online shop Qdepot for reviewing purpose. This is the first time I’m trying a product from the Korean brand W.Lab! Their brand philosophy is to offer high quality ingredients for a reasonable price with their products, by minimizing unnecessary packaging expenses for example. Their products try to replace unnecessary chemical ingredients with natural ingredients aswell. 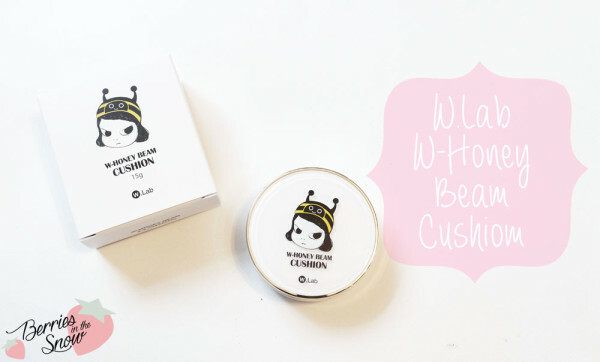 The W-Lab W-Honey Beam Cushion is a popular make-up product in Korea, probably because of the high popularity of honey-containing products in the recent years. It is a multi-functional cosmetics products combining UV-protection, Whitening- and Anti-Wrinkle-properties. 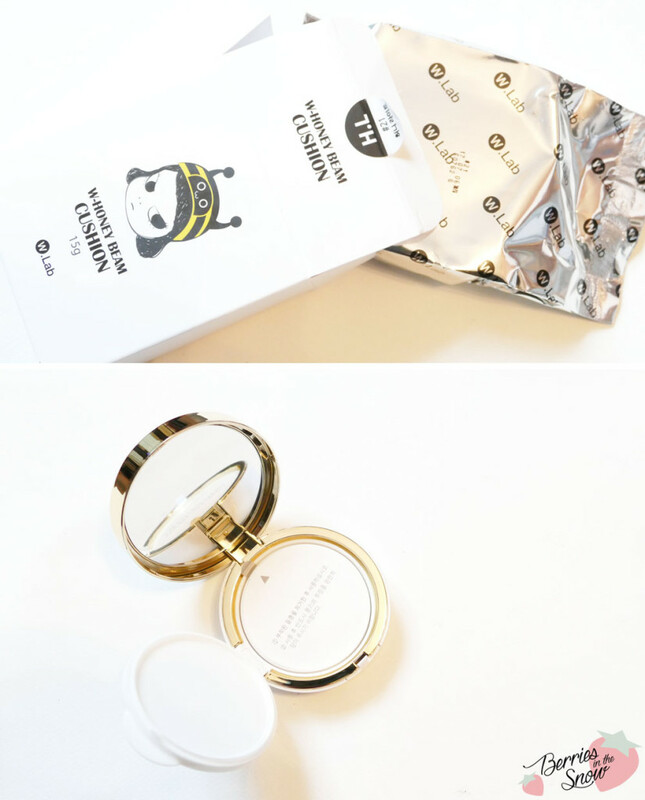 Moreover, the cushion will make your complexion look dewy and moisturized, and is supposed to give you the popular “honey-skin”, which you might have heard of if you are into Korean celebrities and K-pop culture. 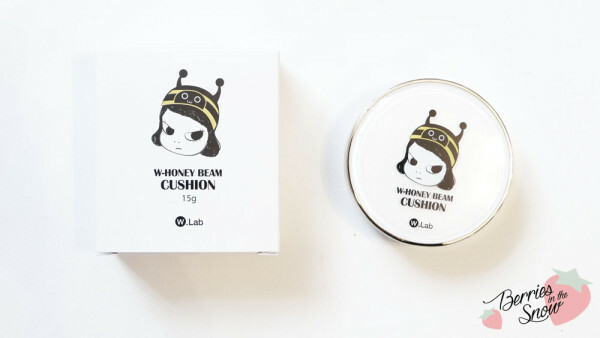 The W.Lab W-Honey Beam Cushion comes in a familiar cushion foundation compact. It has a cute illustration on the lid, a girl wearing a bee-cap. She looks quite annoyed…or focused…anyhow, I like the design of the cushion compact. The compact also has a golden rim, which makes it look more elegant. The cardboard box shows us Korean description only. But with help of google translate I managed to get the ingredients at least most of them. You can find them in COSDNA. 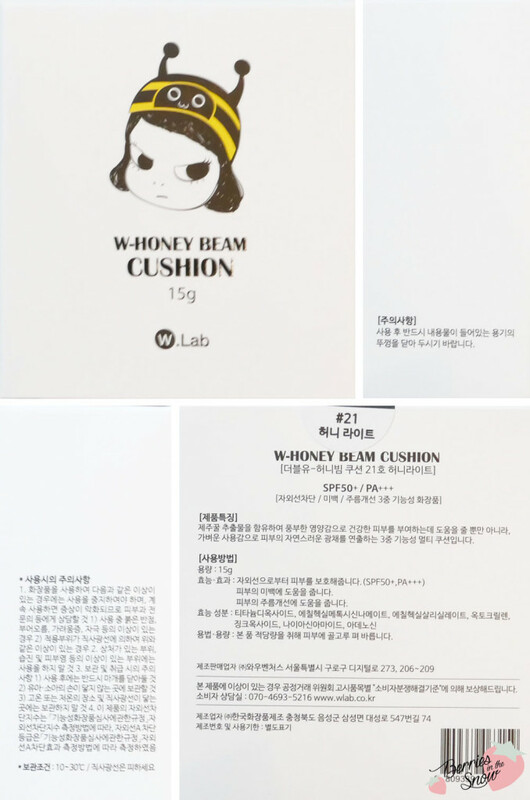 Key ingredients of the W.Lab W-Honey Beam Cushion is honey extract, which makes 39.4% of the product. It also contains Manuka honey, but only 0.1%. You will find Titanium Dioxide, Zinc Oxide and Ethylhexyl methoxycinnamate as UV-protecting ingredients in the ingredients list, too. 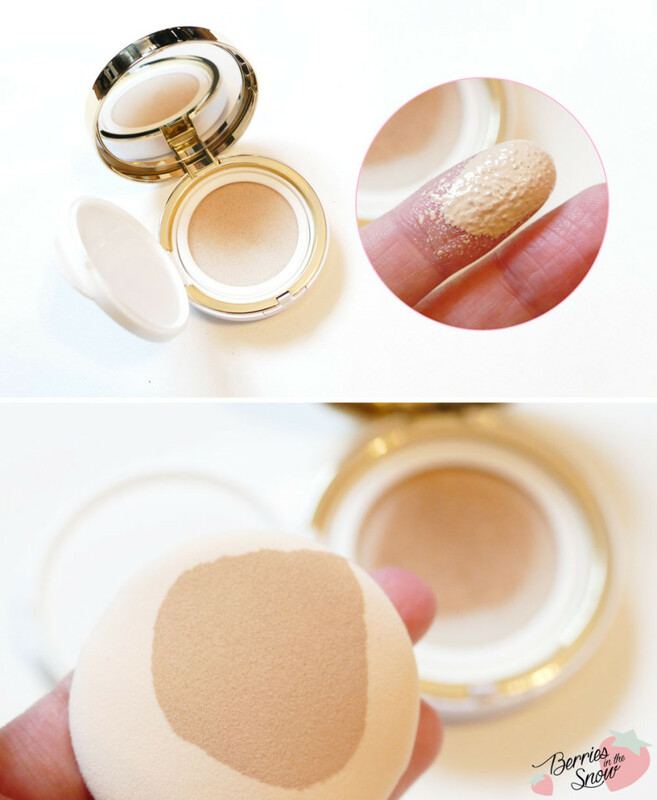 The cushion BB has SPF50+/ PA++. Niacinamide and Panthenol are some of the known moisturizing ingredients. Then, there is a bunch of fruit and plant extracts like lavender oil, lemon peel oil, basil oil, rosemary oil, and so on. The cushion contains 15 g of products, which, if you have used cushions before, can be used up quickly. One way to make the product last longer is to flip over the internal cushion from time to time as soon as you feel that it empties. I do not know if there are any refills available for this cushion, but I didn’t spot any on Qdepot yet, although you can take out the part of the container with the cushion. It doesn’t fit into Missha or Innisfree Cushions though. The cushion compact comes as usual with a mirror in the lid and a puff applicator sponge. The puff differs from the blue ruby-cell puffs you know from Amore Pacific for example. It is not blue colored, but salmon. But apart from the color the sponge itself feels somehow sticky, as if it adheres to the skin. I do not like that feeling too much, and I prefer the regular rubycell puffs. The BB cream is available in two shades: 21 and 23. I would have loved to try No. 23, which suits my skin tone usually better, but I received No. 21, which is a bit to light for me sadly. The cushion is super nicely filled with the BB cream and upon touching it you will get a sufficient amount of the moist BB cream out of the cushion. The BB cream has a light lavender scent, when you are sniffing it directly from the container, but the scent is not noticeable when wearing the BB cream. Below you can see how the BB skin looks when I apply it on my skin. It has a medium to high coverage and is absolutely enough to cover light birthmarks or rednesses. If you have very troubled skin you will probably need a concealer nevertheless. The finish is a satin and dewy one. It is not completelly dewy, but looks partially powdery. 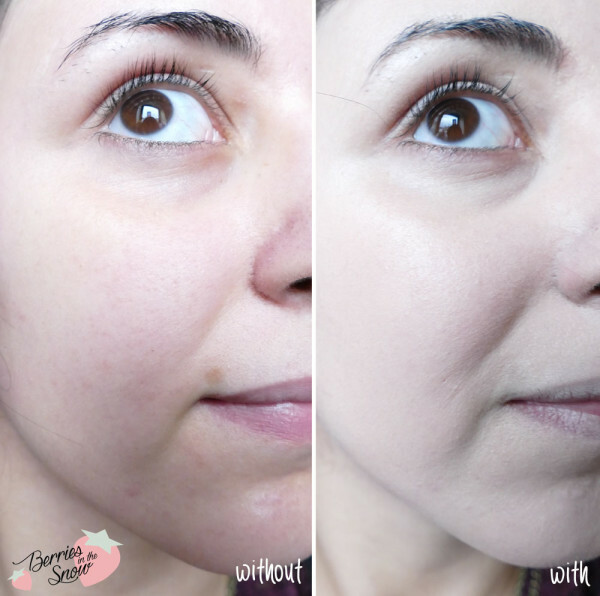 Unfortunately, these kinds of BB creams tend to settle into the lines or around the nose. Nevertheless, the skin does not feel dry while wearing it, but slightly tacky. Flying hair tend to cling to the skin when the BB cream is freshly applied. The W.Lab W-Honey Beam Cushion would be a good candidate for a favourite cushion, if it would not be so tacky and if it wouldn’t settle around my nose. Apart from the not perfect shade it makes the skin feel moisturized and has a good coverage. I like the design of the cushion compact, too. Also, the ingredients are nice and I like the faint lavender scent. The W.Lab W-Honey Beam Cushion retails for 29.55 US$ at Q-depot. Q-depot is an online retailer for Korean cosmetics. They have already quite a variety of the most popular Korean brands and they keep adding products frequently. The site is easy to navigate, too. And they offer free samples for each order and free shipping for orders above US$ 69. What I like especially, that they have an extra section for cruelty-free products, which contains brands like Iope, Innisfree, Etude House, etc. I didn’t see that before for most of the online stores, so that’s something really innovative and nice. Also, they are committed to contributing 3% of their group’s net profit for social causes in different countries. So you can shop for your favorite Korean products and do something good, too. Also, Q-depot is having a promotion were you can get 5 US$ coupon upon signing up. The coupon is useable for a minimum purchase of 69 US$. Great coverage and I like how it neutralizes the red. I have deep smile lines though so I don’t think this one is for me. The coverage is really nice and not too much or artificial the packaging and honey ingredient is great too…a pitty about the settling though. Maybe the one from skinfood is having a better performance. I saw Rini’s review on this too and it seems like there are some issues with this cushion being too light (even for you guys!) and very tacky. The bumblebee is very cute though and I love honey in skincare and cosmetics! I like this kind of coverage best, too, because it won’t look too heavy on you, but can be added if needed. The packaging is really cute and I like the fact that it contains honey. thanks for commenting and reading! I’m happy the review was helpful to you! The packaging is really cute and I like it quite a lot.Thanks for reading and commenting! Lovely review. Shame about the settling in the lines though. How long would you say it lasted for you? I work 10 hour days so wondering if this would require a top up! hahaha I’m just like you tbh, far too lazy to top up once I’ve already applied. Sounds interesting though.